Dr. Ronald Schultz on Vaccine Boosters: Important! I agree that the term “booster” is misleading in that many of the already immune dogs probably receive no beneficial “booster effect” from an infectious vaccine because the virus (e.g. CDV, CPV-2, CAV-2) is immediately neutralized. Therefore, it cannot infect the cells and replicate! It is only in those dogs that have no viral antibody that the vaccine will boost the immune system, both the cellular and humoral response to the virus. It is these antibody negative dogs that I recommend revaccinating, not dogs with detectable antibody. There are, however, components of the vaccines that are almost always boostered such as fetal bovine serum components and other extraneous proteins that are in all vaccines. Obviously, these are components of the vaccine we don’t want to boost especially in a dog that genetically is predisposed to an adverse reaction (e.g. hypersensitivity). That is why we are trying to prevent annual revaccination with the Core Vaccines that provide long term immunity in a majority of most dogs, but not all! Note from Jan: CDV, CPV-2, CAV-2 are the core vaccines — distemper, parvovirus and adenovirus-2 (hepatits). Also, I just got this question on this post: How do I know if I should revaccinate or not? 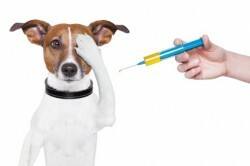 You’ll find answers on which vaccines might be necessary here: Questions to Ask How do I know if my dog has immunity? Read Titer Testing. And read How Long Do Vaccines Last?